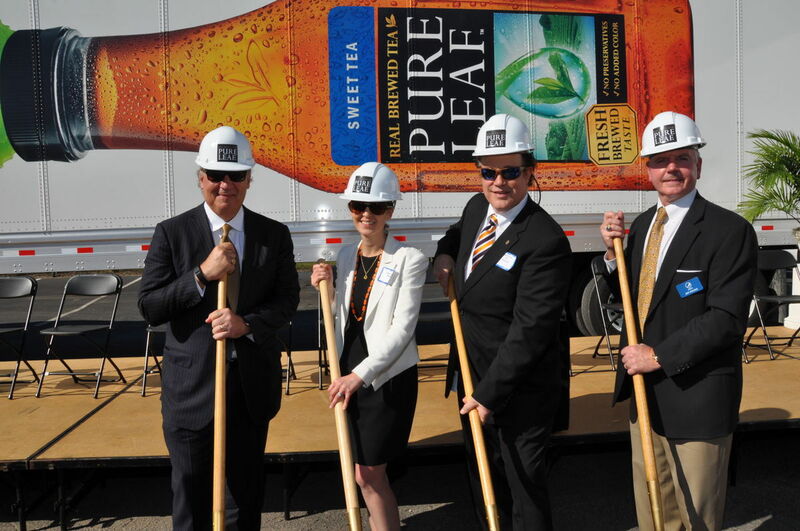 “CHERAW, S.C. –Carolina Canners, Inc., an independent Pepsi bottler and production cooperative, hosted a ground breaking ceremony on Oct. 25. Employees, business partners and state and local dignitaries manned golden shovels during groundbreaking ceremonies for Carolina Canners’ $45-million, 45,000-square-feet plant expansion in Cheraw. Expected to create 40 new jobs within the coming year, the new hot-fill manufacturing line will be used primarily to produce the Pepsi-Lipton Tea Partnership’s fast-growing Pure Leaf, a premium iced tea brewed from real tea leaves. 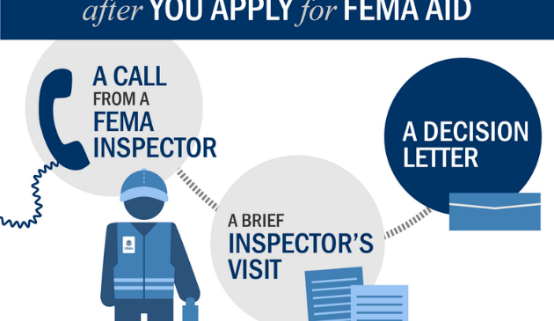 Homeowners and renters in three more South Carolina counties – Berkeley, Charleston and Chesterfield – are now eligible to receive Individual Assistance from FEMA to help them recover from flooding caused by Hurricane Matthew. Individual Assistance is also available to homeowners and renters in these 21 counties: Allendale, Bamberg, Barnwell, Beaufort, Calhoun, Clarendon, Colleton, Darlington, Dillon, Dorchester, Florence, Georgetown, Hampton, Horry, Jasper, Lee, Marion, Marlboro, Orangeburg, Sumter and Williamsburg. 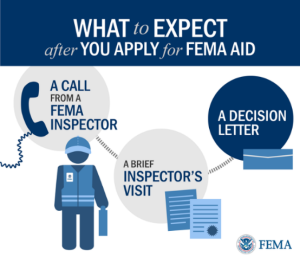 Assistance can include money for temporary rental assistance and essential home repairs for primary homes, low-cost loans to cover uninsured property losses and other programs to help survivors recover from the effects of the disaster. Survivors can register online at DisasterAssistance.gov or by calling 800-621-3362. Disaster assistance applicants who are deaf or hard of hearing should call 800-462-7585 (TTY); those who use Video Relay Service may call 800-621-3362. The toll-free numbers are open from 7 a.m. to 11 p.m., seven days a week. Multilingual operators are available. For additional information, please visit the FEMA news release by clicking here. 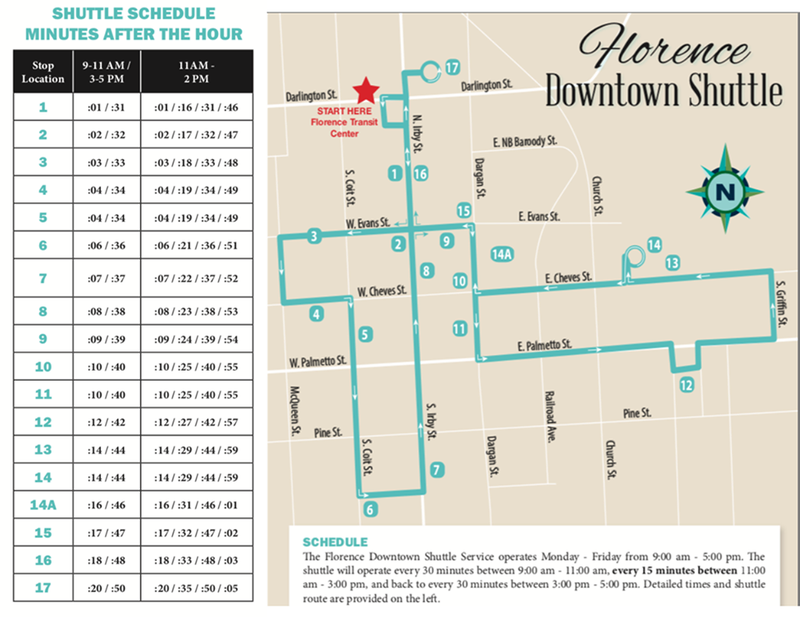 Have you heard about the FREE Florence Public Downtown Shuttle Service? It was made possible with funds from the Federal Transit Administration, the City of Florence, HopeHealth, Access to Health Pee Dee, Pee Dee Mental Health Services, Mercy Medicine and Circle Park. The service is operated by the Pee Dee Regional Transportation Authority. Take a look at the map below for pickup times and places. The U.S. Small Business Administration (SBA) announced today the opening of a Business Recovery Center (BRC) in Florence County on October 28, to help businesses impacted by Hurricane Matthew that began Oct. 4, 2016. SBA representatives at the Business Recovery Centers (BRC) in Florence County can provide information about disaster loans, answer questions and help businesses in completing the SBA application. The BRC will be located at the Greater Florence Chamber of Commerce, 100 West Evans Street in Florence and will be open the following hours: Monday – Thursday, 8:30 am – 5 pm, Friday, 8:30 am – 3 pm and will be closed Saturdays and Sundays. 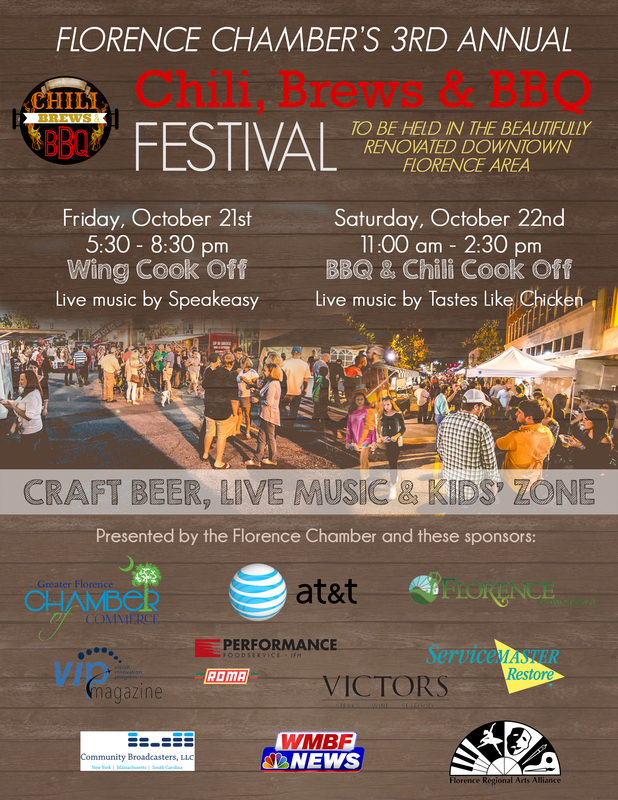 For more information, call the chamber offices at 843-665-0515. “FLORENCE, S.C. — Hurricane Matthew left significant debris and the City of Florence is beginning the process of cleaning up the storm debris from both public and private property within the city limits. 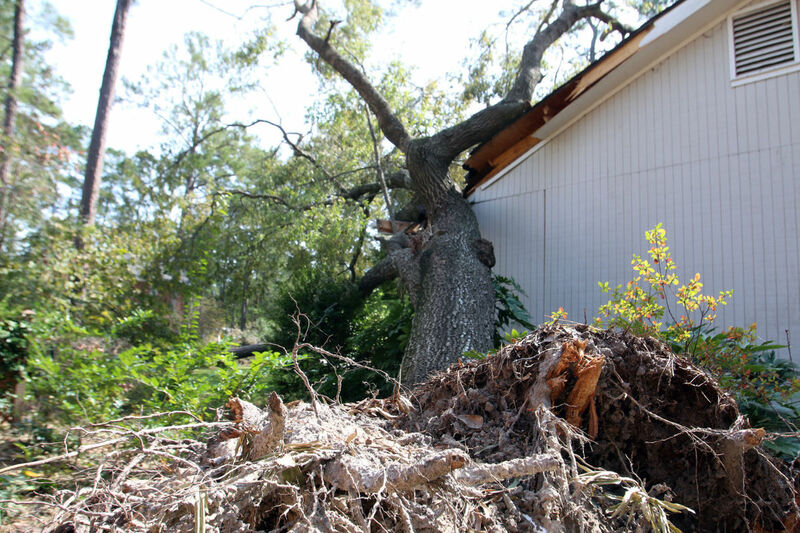 It is important that residents comply with FEMA and City of Florence guidelines regarding the types of debris that residents can leave at the curb for collection as well as how to handle debris if a homeowner hires a contractor for tree and other debris removal. “Our City and many of our residents continue to feel the impact of Hurricane Matthew. We understand this is a difficult time for our citizens and businesses in Florence. The task of cleaning up almost 150,000 cubic yards of storm debris with the city limits is huge and it will take time to complete. As an example, the amount of storm debris is estimated to be equivalent to 4 years of normal yard waste debris collection in the city. The City of Florence asks that you be patient as we tackle this enormous task using our crews as well as outside contractors. Your cooperation will make this debris removal operation proceed smoothly and ensure that the community recovers as quickly as possible. You can further assist with the cleanup by refraining from parking on the street during this debris removal process so as not to impede collection. Hurricane related debris is eligible for pickup and disposal by the city if residents place the following types of debris on the public right-of-way in front of their property for pick-up. When placing debris at the roadside, residents should be careful not to cover or impede access to utility meters or mailboxes. In addition, sidewalks should not be blocked and debris should not be placed in the paved portion of the street right-of-way. 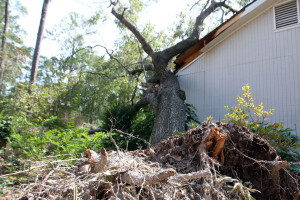 Some homeowner’s insurance policies may cover debris removal. Residents are reminded that if they choose to hire their own contractor, only debris directly related to Hurricane Matthew may be placed on the street right-of-way for collection and disposal purposes. To expedite clean-up where insurance policies cover debris removal, it is recommended that the contractor remove and dispose of this debris. The City of Florence will be collecting hurricane related debris under the guidelines provided by FEMA. The FEMA regulations restrict the period of time and the number of times that debris pickup can take place in a given area of the city. 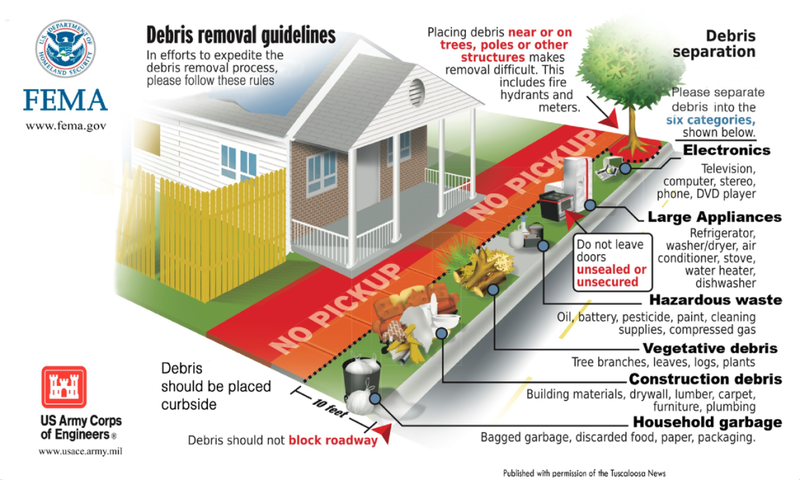 Therefore, the city urges all homeowners to move all debris to the designated area in the front of your property, as indicated on the illustration, as quickly as possible to ensure that it is picked up by the city. We will notify the public at a later date as to when debris removal will end, but we request that you get any storm-generated vegetative debris moved to the edge of right or way as soon as possible. FEMA does not provide funding to local governments for the collection of storm debris from commercial property. Commercial businesses, apartment complexes, and other commercial enterprises will be required to contract the removal of their reconstruction debris or demolition debris. The commercial property owner, insurance company or contractor is responsible for removing and transporting all demolition and/or reconstruction debris to an approved designated landfill, it cannot be pushed to the curb for pickup by the city. If you have questions, please call the City of Florence Public Works & Utilities Department at 843-665-3236 or email Amanda Pope at apope@cityofflorence.com. “FLORENCE,. 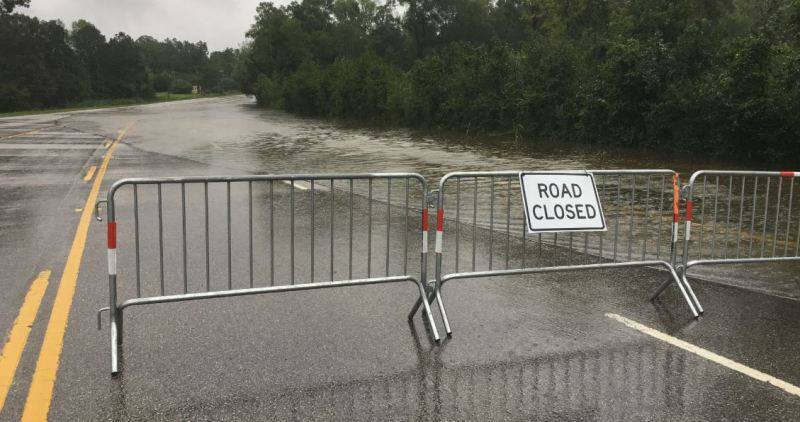 S.C. – Individuals who sustained recent storm damage in Florence County and three other Pee Dee counties now are eligible for federal assistance. In the aftermath of Hurricane Matthew, individuals in Darlington, Dillon and Williamsburg counties also can ask for aid from the Federal Emergency Management Agency, officials in S.C. Gov. Nikki Haley’s office announced Monday night. Individuals in 11 other counties also qualify for assistance. Those counties are Allendale, Bamberg, Barnwell, Beaufort, Colleton, Dorchester, Georgetown, Hampton, Jasper, Lee and Sumter. They join Marion and Orangeburg counties, which qualified for individual assistance last week. 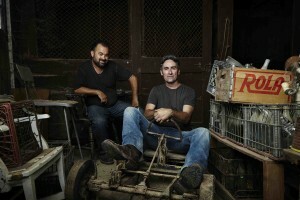 The American Pickers are coming to SC! Mike and Frank, are planning on visiting South Carolina this November and December and are look for people throughout the region that have large, private collections of stuff. These collections can be anything from old vintage cars to sheds filled with large vintage neon signs. 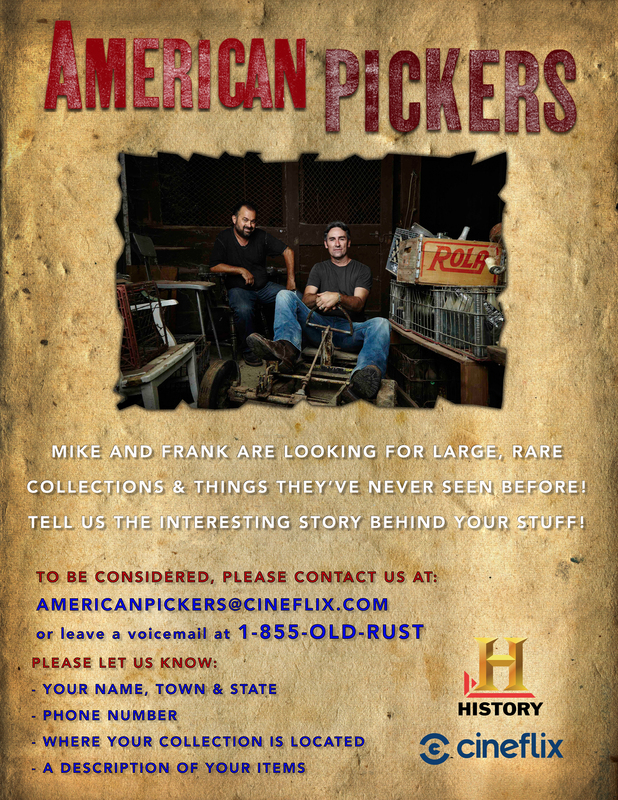 Please note the information below to reach out to Mike and Frank if you are interested in possibly being on their nationally televised show.